Whether you're a devoted sports fan or more of a bandwagoner, there are certain rules that come with dressing for a big game. Don't wear the opponent's colors, don't wear anything you can't get mustard on, and wear shoes you can comfortably climb stadium stairs in. But just because there are certain practical requirements around your game-day look, it doesn't mean it can't be cute too. Case in point, Jessica Biel's latest look is sporty, sure, but also so stylish. 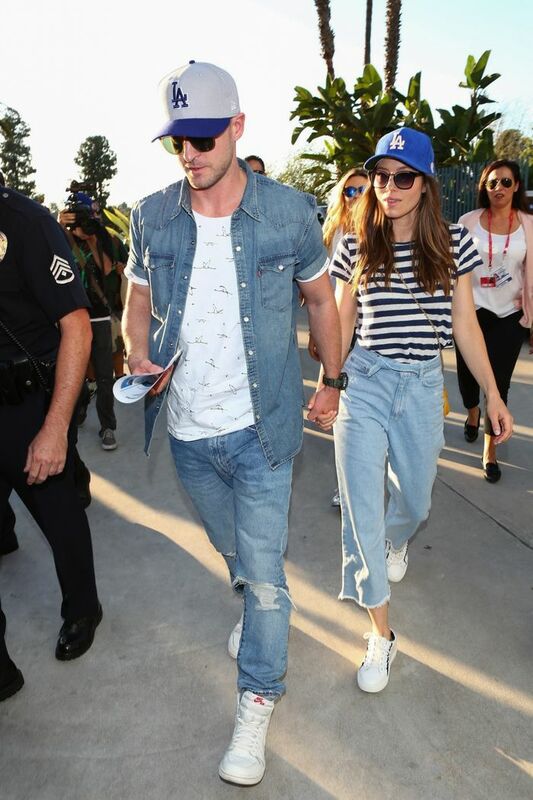 Yesterday, Biel and her husband, Justin Timberlake, attended the Dodgers game in Los Angeles in coordinated denim looks. Biel opted for a chill combination of a striped tee, wide-leg jeans, and sneakers, and finished with a Dodgers hat. By sticking to her team colors while still opting for fashion-forward pieces, Biel offered up some major sporty-chic inspiration. And while her team walked away with a loss, Biel's outfit was a home run. Read on to check out her look, and then shop striped shirts to sport for the next game day. What's your go-to game-day style? Let us know in the comments!